Jed grew up on a sheep and beef property, near Charleville in south-west Queensland. Jed completed a Bachelor of Applied Science (in Animal Production and Rangeland Management) at the University of Queensland, Gatton Campus. Through this degree, he was able to learn about and increase his experience in a variety of industries and commercial enterprises. 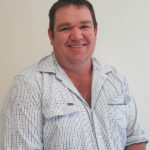 Since graduating, Jed continued to work in primary production enterprises including AMH Beef City, near Toowoomba, Fletchers International Exports in Dubbo, and several private primary production enterprises, and at South West NRM in Charleville. Jed’s practical experience in these roles has exposed him to a variety of problems and solutions at different stages of the supply chain across different locations in Queensland and New South Wales. 0459 862 879 or via email jed.sommerfield@daf.qld.gov.au.